In recent years, as the economic climate has begun to show signs of recovery, the country has seen a rise in sales figures for supercars. More disposable income it seems means more speed for many. But with this rise comes a dilemma for the nation’s police forces; how do they keep up with the Joneses speeding down our motorways? Increasingly it appears that the answer is to fight fire with fire. Across the UK Police forces have started to source high performance vehicles of their own in order to meet the challenge of policing supercars head on. A far cry from the traditional Rover and Vauxhall ‘Panda’ cars with low premiums on one day car insurance, the boys in blue have lately been taking to the road in more powerful vehicles. Officers in South Yorkshire have been covering the county’s roads in a Mitsubishi Evo X, whilst their compatriots on the Humberside force have been policing the east end of the M62 corridor in a V8 Lexus IS-F. And this approach is not just limited to the industrial north, down in the South West, Gloucestershire Police have been trialling the 155mph BMW interceptor. Whilst this may seem a drastic departure for UK forces as we know them, supercars on patrol are a much more common site across other areas of the globe. In South Korea officers have several high performance vehicles in their fleet including a Porsche 911 and a Lamborghini Gallardo. And they are not the only police force to have Lamborghini at their disposal either; the manufacturer famously donated two of their Gallardo LP560-4s to the Italian Police in 2004, although officers are now down to just one after the other was written off in an accident 2009. 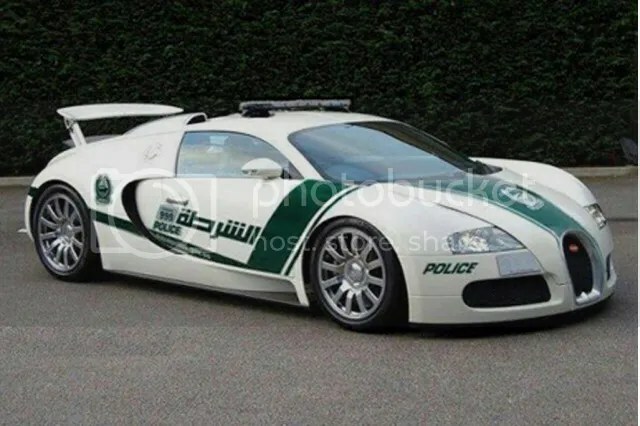 In the money-rich United Arab Emirates losing a police supercar is perhaps less of a trauma than it had been to Italian officers. Money was seemingly not an obstacle to the Dubai force when they upgraded their enforcement fleet. 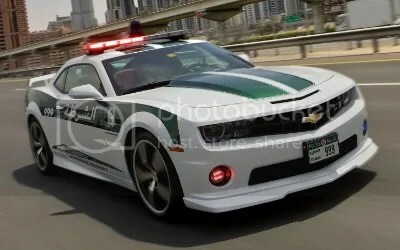 Police officers can be seen cruising round the streets of the city in a range of high performance vehicles including the Lamborghini Aventador and a Ferrari FF, Mercedes SLS AMG, Roush Mustang, Bentley Continental GT, Audi R8 V10, and a Brabus B63 S all done up in the green and white livery of the Dubai force. Anecdotal evidence suggests the swish new vehicles seem to have made officers’ jobs drastically easier too as a number of criminals have reportedly asked to be taken downtown in order to sample the cars for themselves. Despite the high-performance nature of the vehicles, and their incredible top speeds, officers in Dubai have indicated that the majority of the arrests made using the vehicles have not been through high-speed chases through the desert, but for more routine offenses such as prohibited parking or driving without adequate temporary car insurance. Of course there are two sides to the debate, and when the BMW Interceptor was deployed by Gloucestershire Police earlier this year concerns were voiced that such high performance vehicles could be something of a red rag to a bull for young drivers. However, police maintain that the vehicles act as a useful ploy to deter would-be speeders. As PC Angus Nairn told the UK Press when his West Midlands force were loaned a Lotus Evora in 2011; “It’s a very quick car and we hope it will prove an effective deterrent to anyone thinking of speeding or trying to outrun us. It will attract a lot of attention on the motorways but that is the whole idea”.